Sometimes it's just easier for you to Send the files so the other user can download without having to register and select assets. When sending a collection of assets to another user first you will need to add the assets you want to Send into your Basket. You can do this by selecting the Circle button in the asset grid view or in the asset detail page by clicking the Add to basket button. Now that you have all the assets you want to send in your Basket you will click the Send button which is positioned inside the top of your baskets side panel. Scroll to the bottom of the modal and click the Send Now button. If you only want to Send one asset to a user/users click on the asset in the grid to view the asset detail page. In the Action Panel click the Send button. (You might need to close the Basket sidebar so you can see the Action Panel). 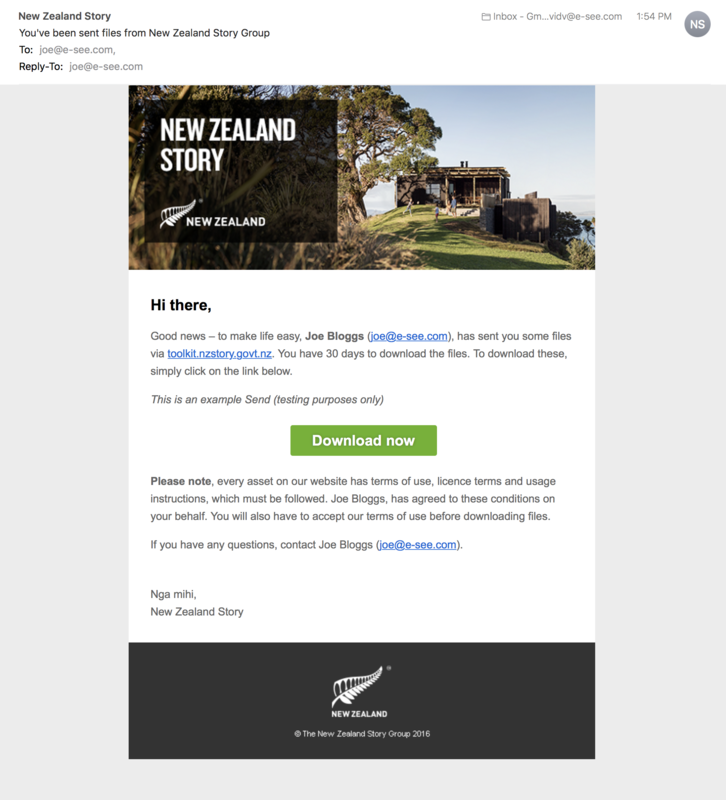 Example email from client account NZ Story.